I don't know what these plants are, but the American tree sparrow does. The bird was plucking seeds and munching them down like a teenager at the hors d'oeuvres table when no one is watching. It fills me with awe that wild birds still manage to find food and shelter in the few scraps of habitat that we have not plowed up or paved over. Like the scraggle of shrubs that grows up in the fenceline along a country road. 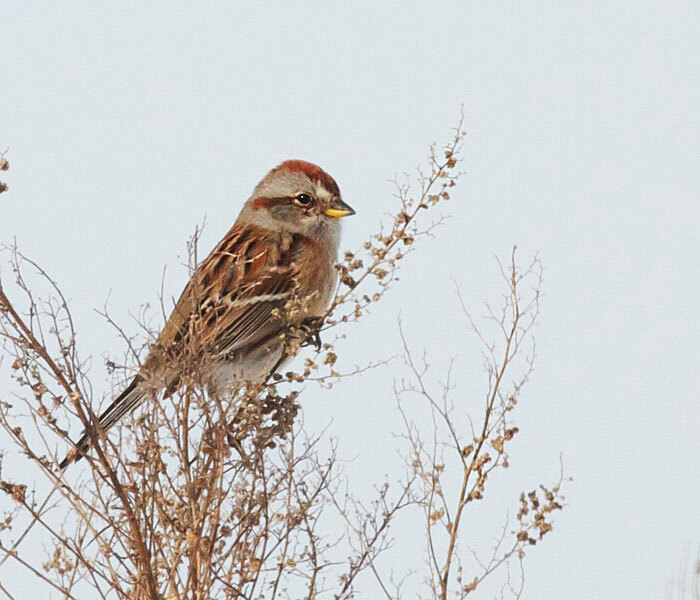 When we start watching birds, we're surprised to find there are dozens of species of sparrows native to North America. This DVD shows them all, in color, in action, and in song. If there are a few sparrows you still need to master, this 2-DVD set will help you to know them like you know your own friends. Beautiful work!